Dr Peter Stassar, technical director of optical research at Huawei in The Netherlands, set out the situation starkly in his plenary address: ‘Who will step up and pay for all this new technology? Who will buy it?’ Everyone agreed, he said, that the need is there – that there is a continuous need for new bandwidth. And some, at least, of the technology, such as integrated photonics, has been developed. But integrated photonics is not a technology that is used in consumer applications, so where is the ‘killer application’ that will make it widely and cheaply available, he asked? Evidence of a different sort of pressure on the economics of the industry was evident on the exhibition floor at ECOC. Companies willing to supply current technology very cheaply were evident in large numbers – more than half the floor area was occupied by small booths from small Chinese set-ups, offering cheap and cheerful components and equipment. It prompted some complaints sotto voce of customers using the cheap Chinese companies to beat down their existing suppliers on price. In at least one case, a Chinese company was alleged to be selling technology that had been patented by the (non-Chinese) company opposite, and the Chinese supplier was able to do so cheaply precisely because it had not paid for the intellectual property and the rights to the technology. Yet the owner of the IP felt that they had no practical recourse. Another trend in the industry that was very evident at ECOC was the focus on datacentres. Alessandro Messina, EMEA marketing and business development director for Anritsu, said that while the company had a long history in optical long-distance transmission, ‘We are evolving like the market from transmission testing to data communications.’ The distances may be shorter but the quality demanded was higher, he continued, making testing – Anritsu’s speciality – all the more important. The global thirst for information seems unquenchable, with a concomitant rise in demand for data storage and processing. Datacentres themselves are getting physically larger, which means that the interconnects between the servers are getting longer, which means that existing technologies are no longer adequate. PAM (Pulse Amplitude Modulation) is one of the techniques being developed by telecoms equipment manufacturers and component suppliers to meet requirements for data rates as high as 100Gbps in the backplane and in server-to-server connections and Anritsu was demonstrating a PAM4 signal simulation system on its stand at ECOC. The geometry of backplanes is set to change, according to Adit Narasimha, director of active optics for Molex, who predicted that server backplanes in datacentres would (and should) increasingly look just like cables with their connectors, than the circuit boards with sockets of current conventional backplane. Active cables embed optics and electronics within the connectors which can translate electrical signals to optical ones, and vice-versa, allowing longer distances, and greater flexibility in the way the datacentre is configured. Active optical cables can serve to connect both within a rack and between racks. Moreover, for equivalent data rates, optical cable (which does not need electrical shielding) is thinner and lighter than copper wire and has a smaller bend radius. Finisar, too, has its sights set on the datacentre as a market that the company wishes to develop, according to Victoria McDonald, the company’s corporate communications director. 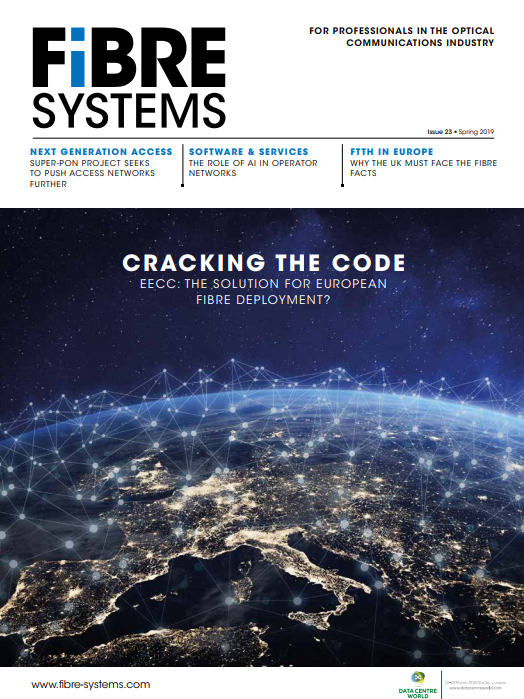 Indeed, Finisar has created a dedicated website opticsforthedatacenter.com, she pointed out, dealing solely with the issue of datacentre interconnects, including not just intra-rack and inter-rack connectors but also long-span (up to 10km) inter-building connectors. However, as Anritsu’s Messina pointed out, the demand for higher speeds of data transmission over longer distances was not just an issue within the datacentre; it would inevitably spill over into long distance: ‘We want to see how the whole Cloud architecture is going. What are datacentre to datacentre communications going to be like? There is a lot more evolution in the Cloud.’ It was a theme echoed by Narasimha of Molex, who predicted that silicon photonics and datacentre architectures would be ‘the engines of the Cloud’. Voll believes that commercialisation of 400G will start within the next three to four years but, looking further ahead, he sees problems in packing so much capacity into today’s fibres as he believes we are getting close to the Shannon Limit. For that reason, Coriant is one of the participants in the EU’s Mode-Gap project, coordinated by Ian Giles, CEO of UK-based Phoenix Photonics. ‘There is a capacity problem,’ Giles maintained, ‘and we need to be looking for solutions now.’ The aim of the project is to develop multi-mode, photonic band-gap, fibres for long-haul transmission. These fibres offer the potential of order of magnitude capacity increases through the use of multiple-input-multiple-output (MIMO) operation of the multi-mode fibre capacity and further order of magnitude capacity increases through the ultra-low loss and ultra-low nonlinearity offered by multi-mode photonic band-gap fibre. At first sight, developing new fibres might seem to be at variance with the view of Glenn Welbrock of Verizon that the task is one of cost-optimising the network rather than technology development, but Ian Giles envisages a process of gradual upgrades to put higher-capacity fibre into the traffic hotspots in a network rather than trying to put new fibre into the ground everywhere. So it may be that the technologies on display at ECOC this year will be able to resolve the dilemmas posed so starkly by Stassar and Welbrock.